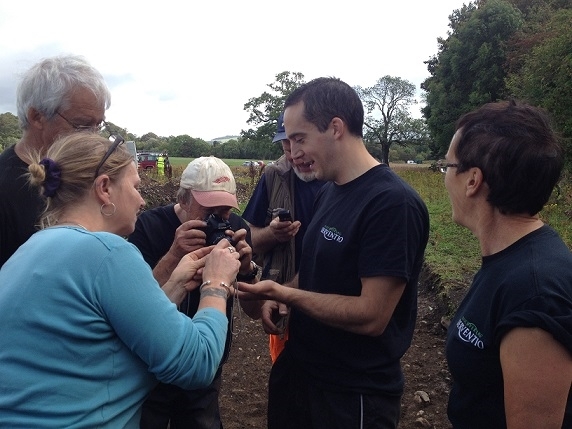 During August, September and October 2014, Grampus Heritage worked once more with Wardell Armstrong Archaeology and our dedicated volunteers on our last open area excavation of the project. We decided that we would go back to the area that started the project – Broomlands field, on the outskirts of Cockermouth. From our previous survey and evaluation work in 2010, we knew that there was a lot of activity in this field, so we decided to concentrate on the area near the old train line and modern road, in order to try and understand more about the activity going on across the river from the bathhouses and the forge sites. 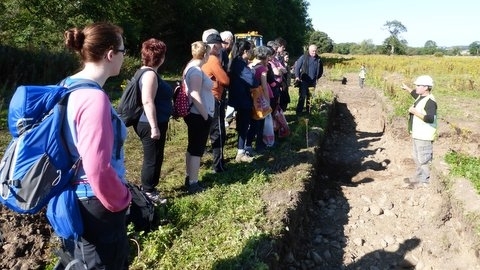 We would like to extend our thanks to the landowners Mr Robert Jackson and Mr Eldred Curwen, the land agent Edwin Thompson and Mr David Robinson, Dovenby Craggs farm for their permission and support in this excavation. 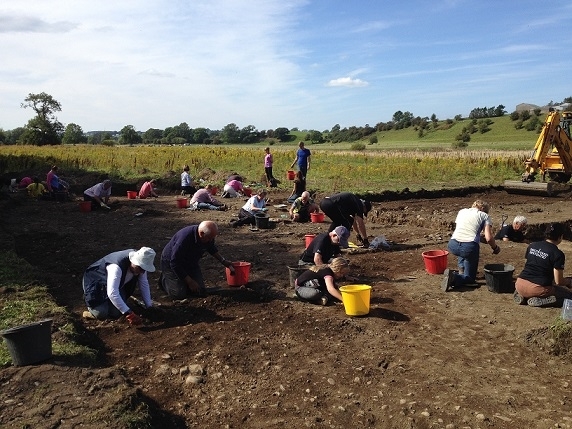 We opened the site, as usual, during the last week of August, allowing people who could only join us in the remainder of the school holidays to visit site and have a go. 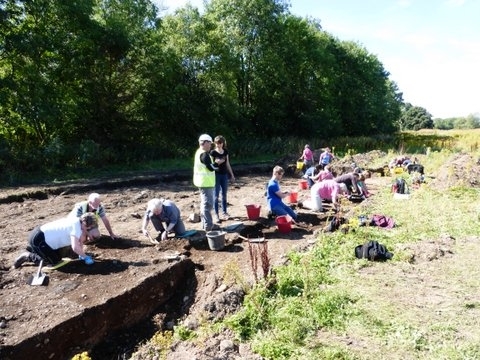 We were joined by many volunteers for this final open area dig, and we were very pleased to see many regular faces, but also lots of new volunteers. A big thank you to everyone who were able to give us their time on the site- you contributed to a total of 573 volunteer days!! 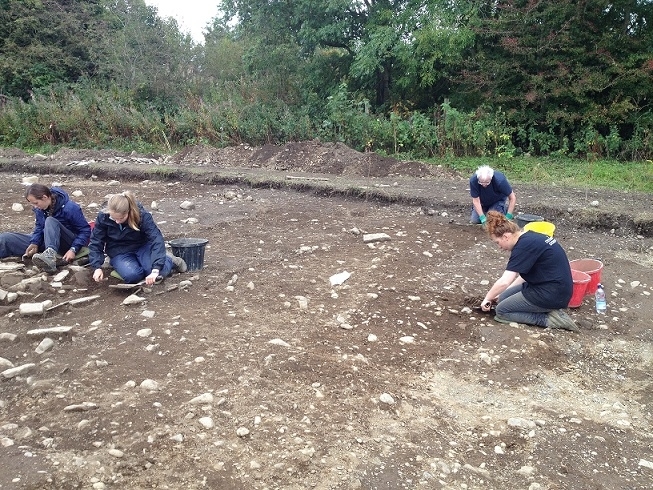 A big thank you also to The Lakes Home Centre and Lloyds, Cockermouth for allowing our volunteers to use their car parks for the duration of the excavation, especially when the rain came. 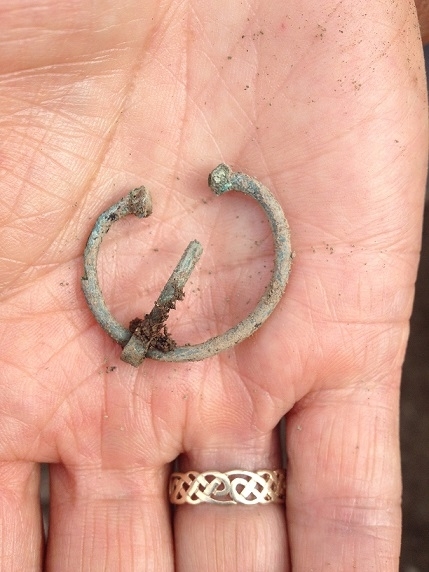 From the start, the site promised to keep us guessing but also reveal some amazing artefacts. 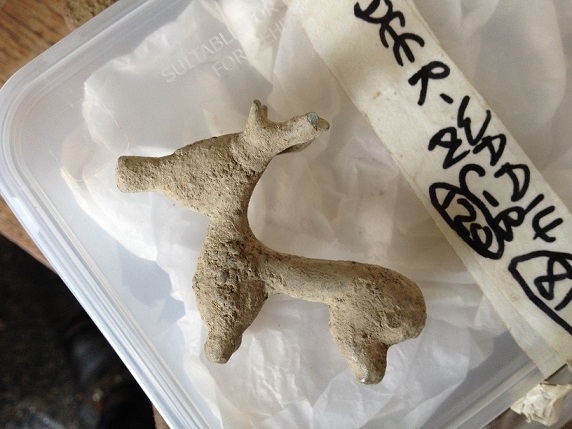 Our volunteers were lucky enough to uncover finds such as coins, brooches, miniature animals such as a deer/stag, a wild boar and some little animal ears, miniature pottery vessels (libation bowls), lots of worked stone which included altar fragments and carvings, such as the Genius Loci with the cornucopia, the 2 female heads and bits of other statues. 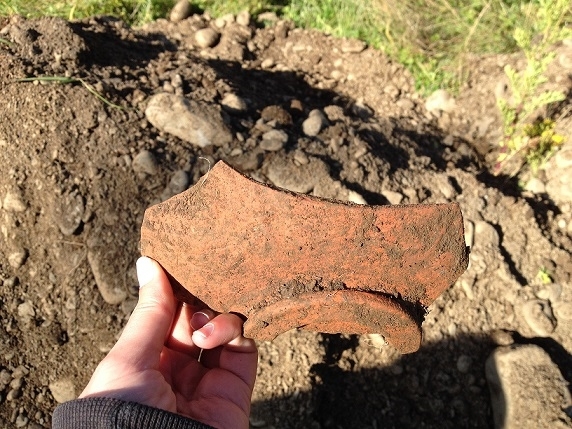 The volunteers found a variety of pottery on site including Black Burnished Ware, decorated Samian ware, amphorae and mortaria. 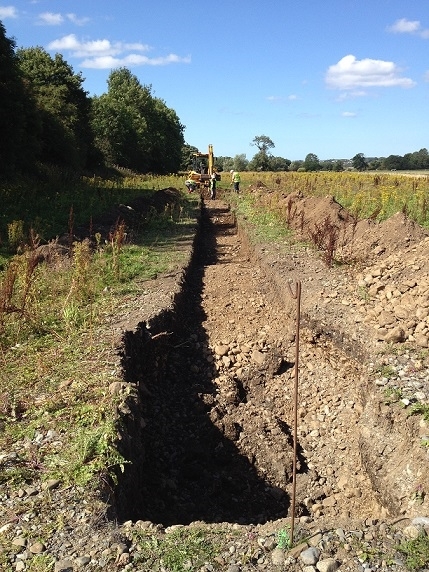 For any volunteers and visitors coming to site, they would have seen that the trench had various levels. The archaeology was spread through out the trench and in some areas, there had been build up of material before the next occupation phase. 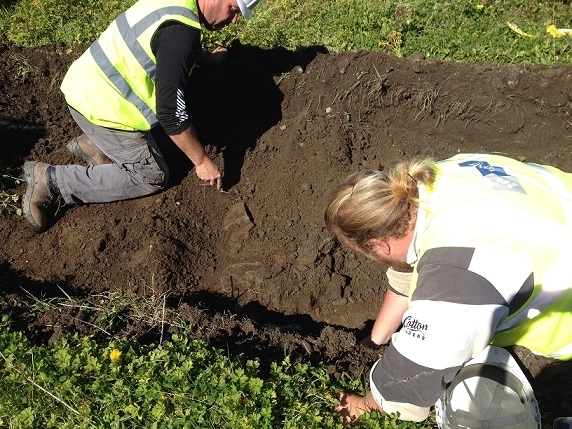 The team had some difficulty on this site, as the features were cut into these build up deposits, so there were challenges in identifying edges of ditches, postholes and pits. 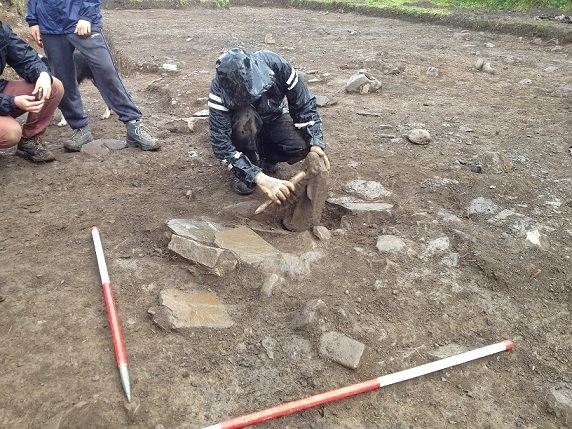 We also had indications of buildings somewhere in the area – roof tiles, worked stone, window glass – but no evidence of foundations. 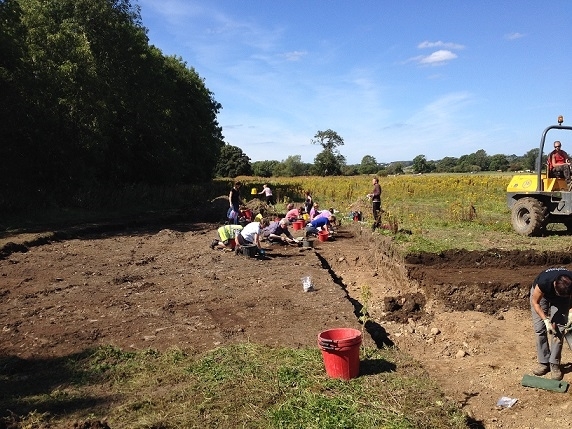 This was different to our past sites, where we had very clear building foundations and could plan the separate phases that had occurred. 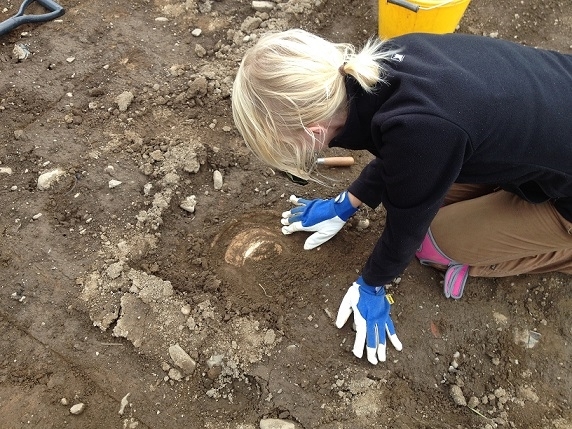 We also had very black deposits with charcoal, burnt bone and various finds, such as nails and a range of pottery, mixed in. 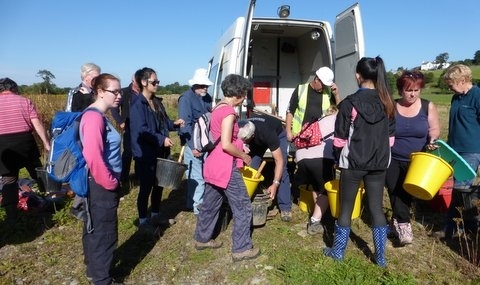 These deposits tended to be finds rich, so when the education outreach programme started in the final 3 weeks of the excavation, run by the Senhouse Museum, we put the school children in these areas, and they found lots of interesting pieces of pottery. 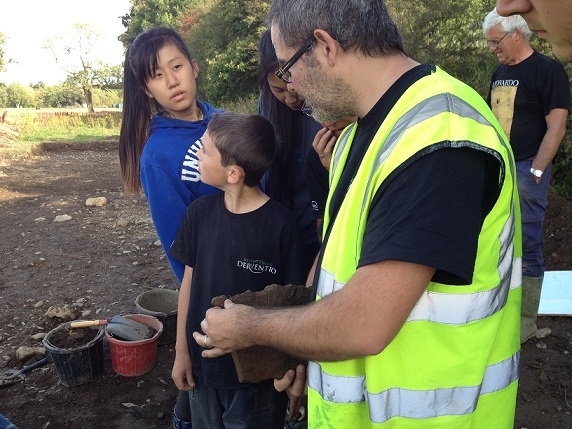 We had several local schools visit us to take part in the digging and do some finds washing. 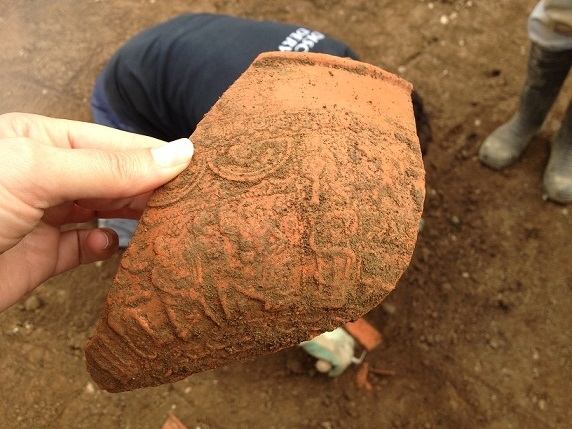 As well as digging up some interesting finds, they were also discovering exciting things during the washing, such as pottery with graffiti scratched on. It was nice to have the school kids on site again and see their enthusiasm for the activities. Through the programme, we had over 280 school children join us this year. From the site, the location of the bathhouses and the forge were plain to see. 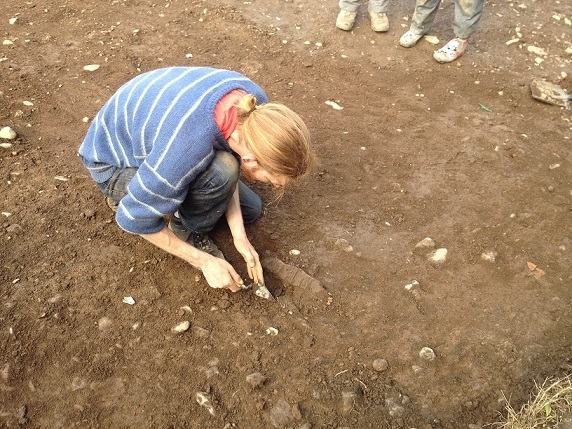 One of the aims of this excavation was to see if we could find any indication of a river crossing that would link the 2 sides of the settlement. 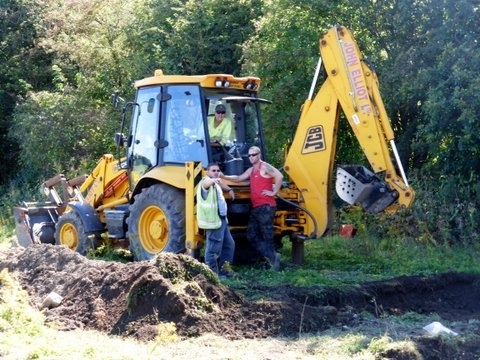 The diggers were brought back in and the results were better than anyone had been expecting. We found the foundations, that had been back filled with rubble, of a bridge, the old river bed and further north towards the river, the remains of a pier. 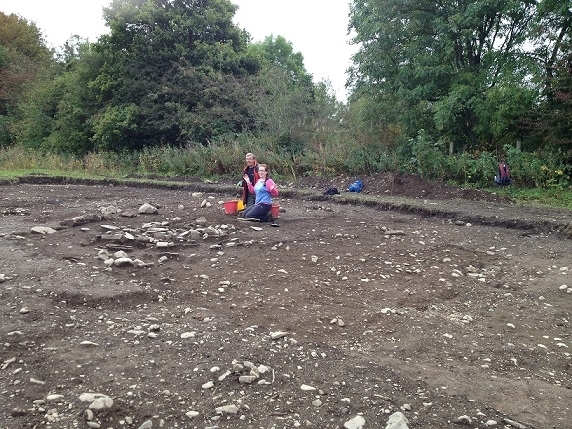 The discovery of the bridge was a fantastic addition to our understanding of Roman Papcastle and Cockermouth and a key component in recreating and understanding the historic landscape. 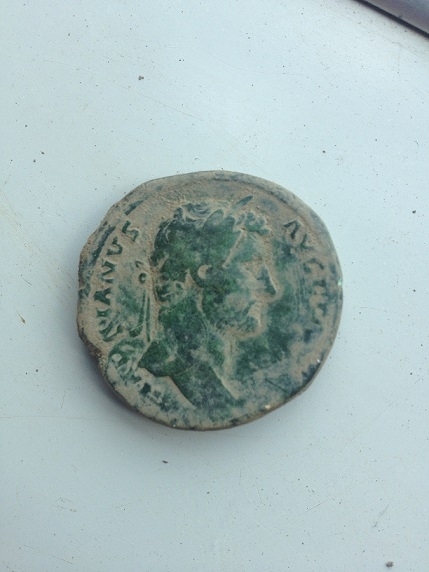 Associated with the bridge abutment we found two fragments of inscription (probably funerary though they have not yet been assessed). 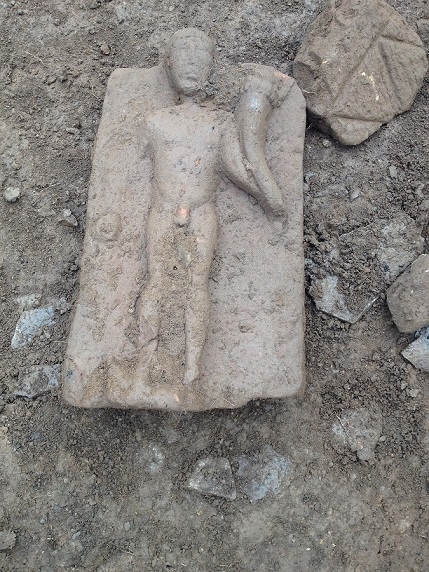 We also found two altar fragments, one of which was used as the corner of the bridge foundation, two carved heads from statues and the base of a third statue in the rubble of the bridge pier. The abundance of worked stone reused as rubble in the bridge construction suggests that this this particular bridge may be quite late in the Roman period and perhaps even post-Roman?? Towards the end of the excavation we encountered significant rainfall which led to the river rising and left the bridge trench something of a challenge to excavate (without scuba gear). However, after a few trial runs with pumps and sandbags we did manage to get rid of the water sufficiently to cut samples of the 2 in-situ timbers forming the base of the pier and backfill the trench immediately in a relatively dry state. These will be sent off for dendro-dating and we will reveal the results when we receive them. 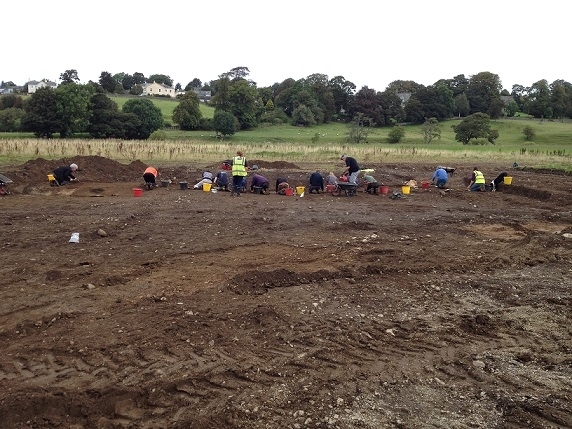 We are now in the post excavation stage of the process, so all the finds are being assessed and reports compiled to put into one final report, which we will put up available to download once it is complete. 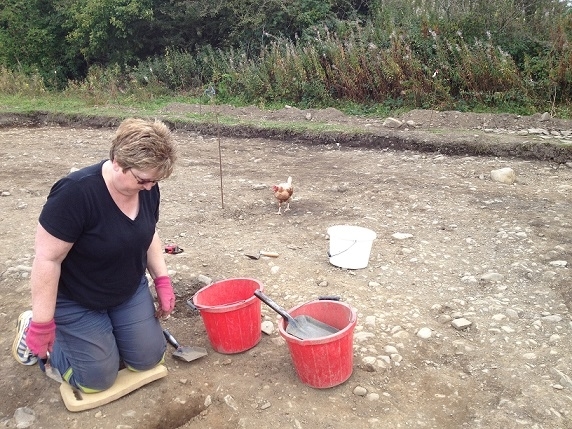 The gallery below shows the site and some of the highlights of the excavation. If you have any questions about the site, or about the project as a whole, please do not hesitate to contact us.